Situated on a lovely canal in Colington Harbor, you will truly find peace and tranquility for your next (much needed) vacation! Enjoy the community amenities taking in a game of tennis, enjoying a dip in the community pool or bring your boat and utilize the boat ramps to take in some gorgeous views of the Albemarle sound and catch your next meal with some top-notch fishing (don’t forget to grab your fishing license at any tackle and bait shop!) 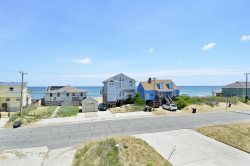 With stunning views and ample ways to enjoy the waterfront, Grace Cottage is a perfect getaway for a myriad of OBX adventures. After a full day of soaking up the sun and sound, head inside and reconnect with the family in Grace Cottage’s undeniably gracious interior. The central living and dining areas overlook the open water, while the three bedrooms are perfectly peaceful for guests in need of a good night’s rest. For the best views, step outside and enjoy stunning sunsets via the spacious sunny and covered decks. No matter how you love to unwind, Grace Cottage lets you relax with ease – all while enjoying a stunning sound front vista. Love love love Grace Cottage! Beautiful sunsets, comfy house. Beautiful landscaped yard. Will rent this one again ?? Wonderful home! Beautiful view from deck at sunset undersold in house pictures. (+ Bonus meteor shower!!). Well equipped kitchen. Loved water access for renter kayaks partially subsidized through Vaykay partnership. Excellent experience all around- thanks so much!